This is incredible. I didn't read the description about addiction, and got it from it about my second go through. Your art also just really perfectly made me feel the things that I had to to get this game. I can't wait to see you make more things, you're incredibly talented. Nice game and gameplay let me know of your different endings. it'd be your beautiful artwork. I normally don't care for black and white. Something about it in this just felt right. The atmosphere, the tone, it all just came together. I enjoyed the dual meaning! Where it could represent what it actually does with addiction to drugs or, just a straight kind of abusive relationship! Looks great, and the subject matter is explorative and deep. I especially enjoyed the art style, and undistracting background music. Thanks for creating this! The way you presented this actually hit really close to home for me, I have a very different style of approaching games when I record, but the way you made this had me questioning my life choices by the end. I'm amazed, really. In my video, I kept calling it "I Woke Up" Because I'm sick and haven't gotten more than a few hours of sleep in the past few nights, so sorry about that! Loved the game! The art style was just as amazing as it was in "He Beat Her" but it was also very different. I loved the noirish feel and the cool glitchy effects. The music was spot-on. I would have to say that the story was a bit more confusing but it was still very interesting. Keep up the great work and I'll definitely keep following all your awesome games! i've gone through it once and i need to get the rest, it's so amazing! The music makes the atmosphere so much better and the artstyle is awesome, I'd love more games like this! Loved the Art and Sound design of this game, absolutely stunning for a indie game. I recognized the art style and knew I just had to play this. ( ﾟωﾟ ) It's great storytelling and the visuals were just fantastic. I'm surprised there was even a male and female selection. It's a small touch, but it's a nice and greatly appreciated option. I really enjoyed playing this and the music was quite lovely as well. It really sets up the mood for everything and I can definitely see the whole 'dreamlike' aspect of it. Anyway, great job and wonderful art as always! This is such an interesting way to tell a story of addiction and overcoming it (at least based on the ending I got!) The visuals are breathtaking and the background music is solid. I liked the choices presented throughout the game, I normally select the option that corresponds with what I'd do or say given a situation and I'm quite satisfied with the way things turned out, but I am curious as to what the other endings hold. I hope you don't mind, but I recorded a short let's play of the game. You've done some fantastic work here, this is very much a real game, it tells a story that could happen to anyone and shows just how powerful an addiction can be, truly fantastic work. thank you for the kind, detailed and well thought-out comment. And great lets play, I totally don't mind. This game was interesting... very interesting! I loved the art style and the story was so interesting but i must ask how many endings are possible? Great job! and now I've read the description and see there are 4... im smart. Great art, music and story! Good Job as always!! The art work is just amazing! I know it's about addiction but I couldn't help but trying to make the relationship work with the first girl! I got the addicted ending, leaving ending, and with the 2nd girl ending? Not sure if where is the 4th one. Did I get it? I'll probably going through this game again after this post. Very nice game! This is an interesting game. I've got shivers down my back at a certain part. I am curious on what this game is about. I know this is about a toxic addiction to something, maybe a fantasy than reality. The person didn't know which is which. But it's still an interesting game, the art is good, the glitches/statics when the player is in some complicated situation and the soundtrack. Although, it's hard to know if you got the same ending or different ending with some choices. It's simply said The End. The player. 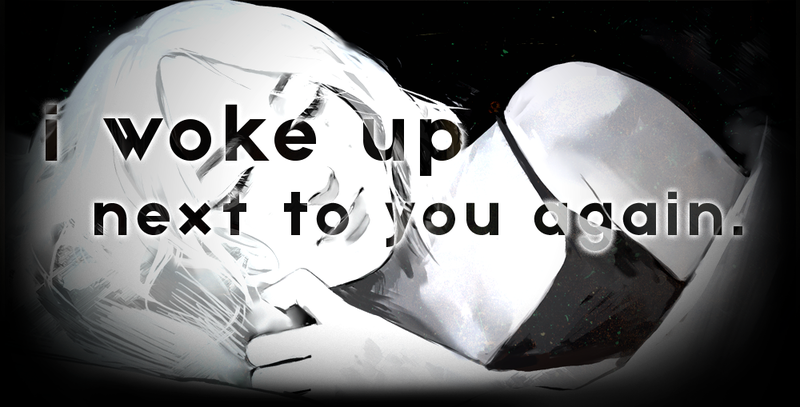 At some route, the player can choose to either to stay with them or leave them. If the player choose to leave them, they soon realized that they are not real. Is the player in some delusional state when they recently move to the new place? It's such an incredible idea in portraying addiction (or is it another mental distortion?) through Him/Her; with simple but graceful scenes and BGM which carry out the shivering atmosphere of the story. thank you ^^ yep it's addiction. i love this impactful, real game. would definitely recommend to just about anyone. dude seriously? I'm not feeling well atm but I read every comment. Super good playthough on this game! I really enjoyed it and the multiple endings kept things super interesting! I love the style of this game and its true meaning and story behind the text! This was a really well put together game and I LOVED the visuals!!! Thank you for making it! Usually, I have some critiques at the end, but this was so well done I was actually left praising it more than anything! omg thank you for kind words esp at the end! :)) really confidence-boosting!